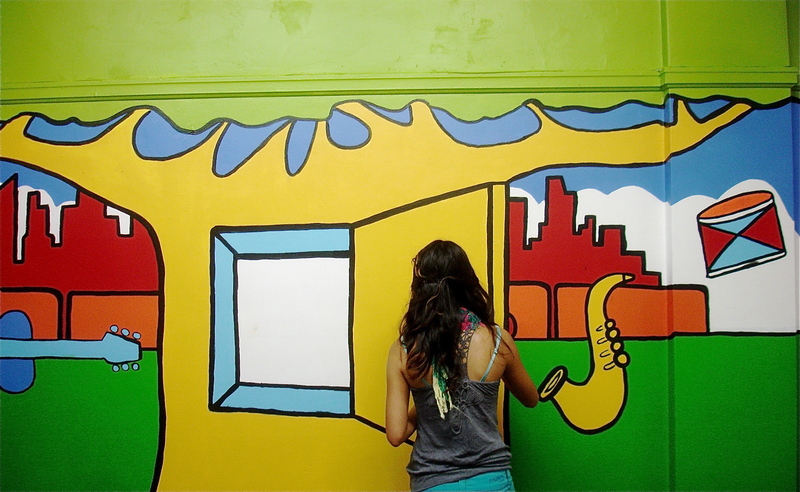 June 2012 :: New Residency & Mural at HALA. OK. 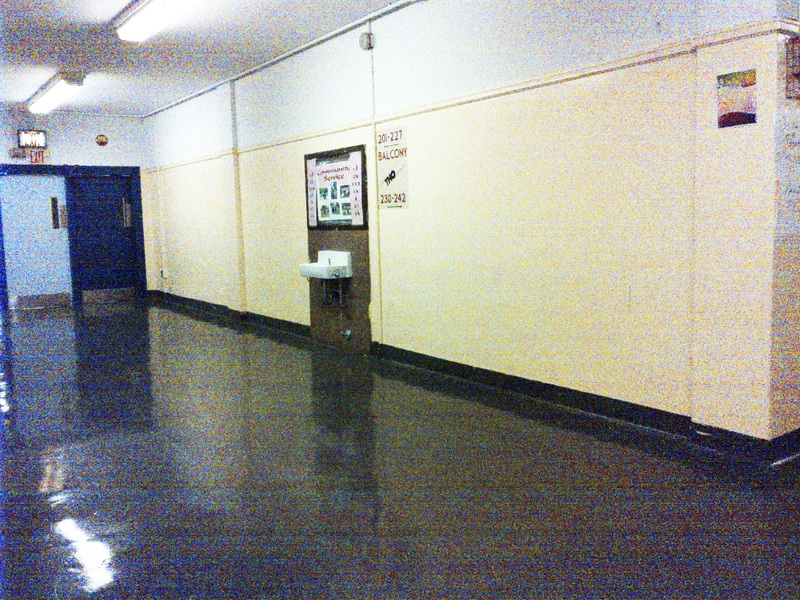 I know that you see a dark grainy image of a drab hallway, but that is all about to change over the next 4 or 5 weeks. What you see on this large blank wall is also about to change. The wall measures over 20 feet in length and over 10 feet in height. It is literally screaming for a mural, and so it will be. 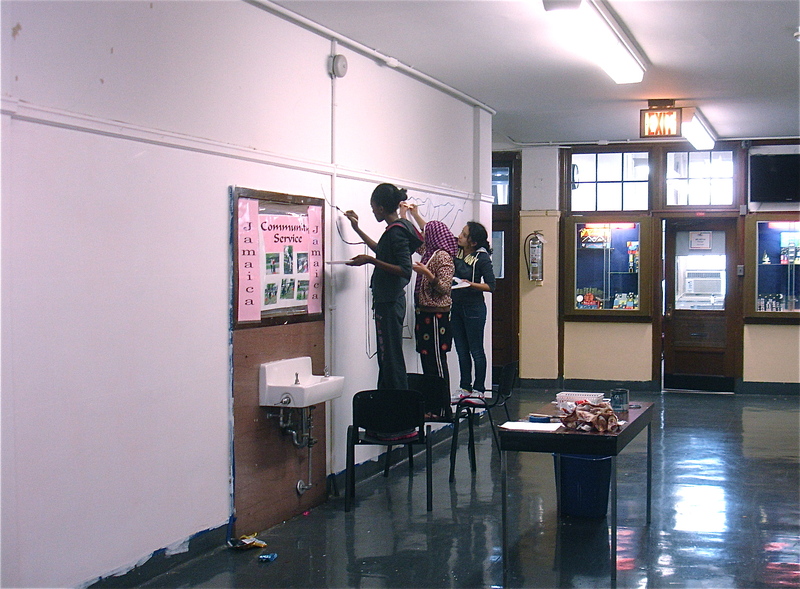 My good friends over at Jamaica High School’s Hillside Arts & Letters Academy (HALA) have invited me back as a guest artist in residence to work with their students on the project. This will be my third project with the school. I could not be more excited. Generally, I will meet with the students twice a week for the next 4-5 weeks as they complete their school year. 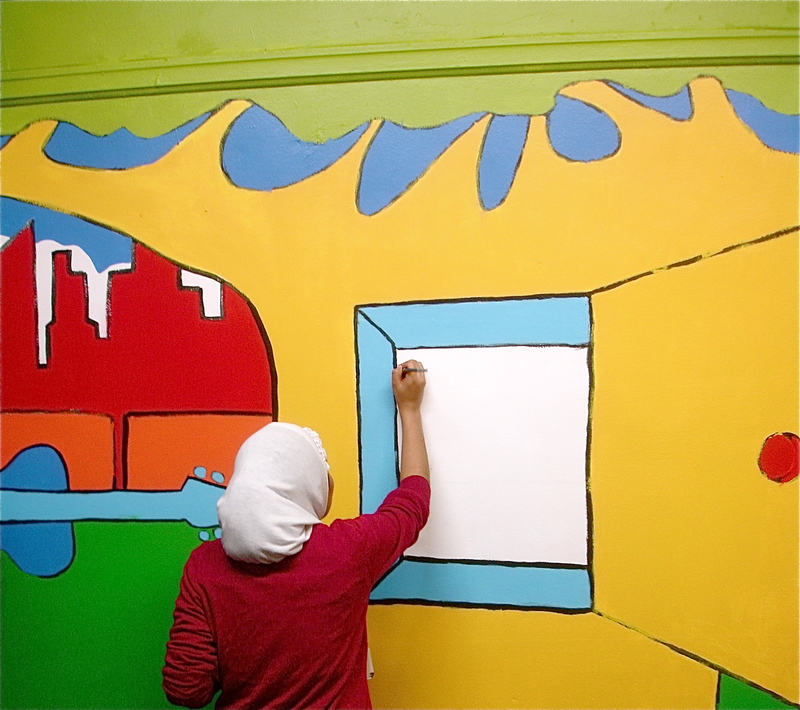 HALA has a special emphasis on the arts, so this will play a major role in the mural content and over all communication. This week we focused on building ideas and concepts as well as building a preliminary sketch of what the mural will look like. The emphasis of the sketch discussions were on the over all unification of the school. We spoke about the students, and their relationship to its various disciplins. A two hour brainstorming session produced many great lists of words that later transformed into images. We started to arrange those images into compositions. A rough study of three pages were joined together to generate a small scale rough vision. 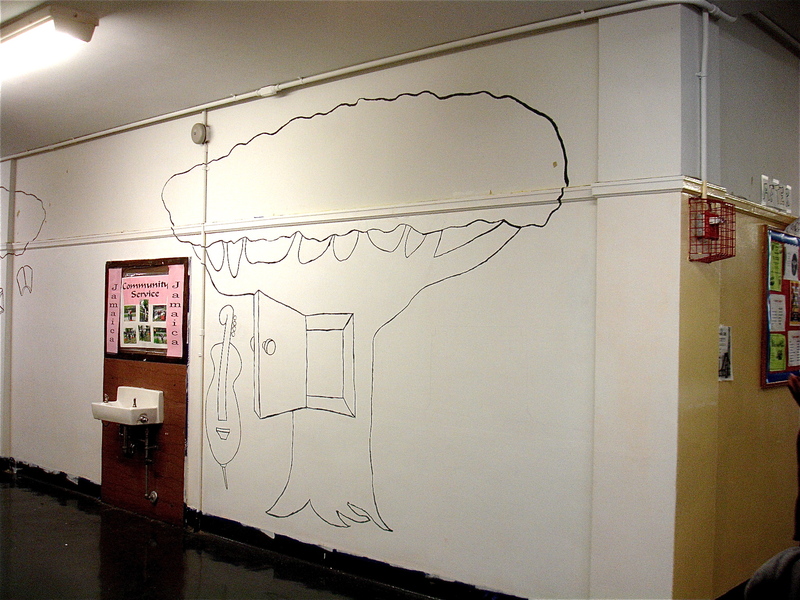 While we are still refining our final drawing, we all thought it would be a good idea to sand and prime the large wall. It is now officially prepared it for painting. Follow this post to watch our progress. 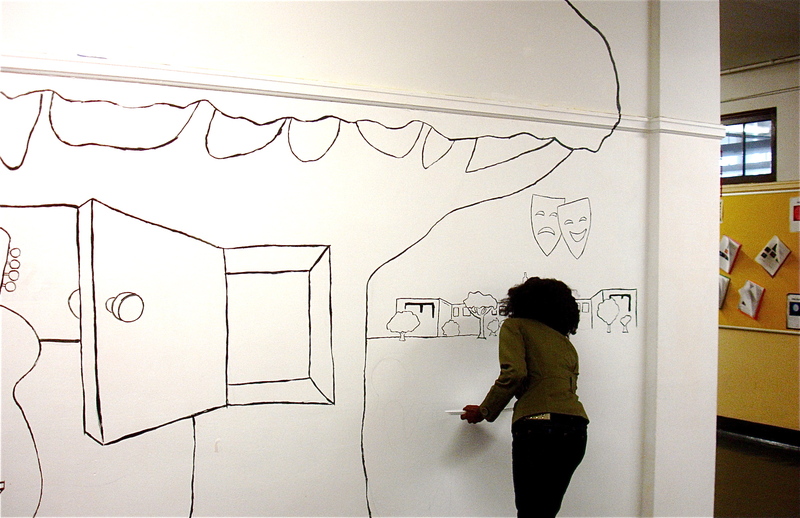 With our wall primed and ready for painting, we began to transfer our drawing to the wall. The transfer process was done free hand by using our refined pencil sketch as a map. The students also added additional content to better navigate the composition. This was important as these decisions needed to be made site on scene based on the process. It was very organic and flowed quite well. The students spent this past Monday 6/4/12 also painting a black outline around the drawn landscape, objects, figures, and things. We looked at the art of Keith Haring and have decided to reference his work stylistically and technically. The outlines helped separate our images and distinguish the overall composition. This will make our next step easier. This coming week we will begin working with color. A color study is also being created from a scan of the original pencil drawing. this too is an important part of the process. 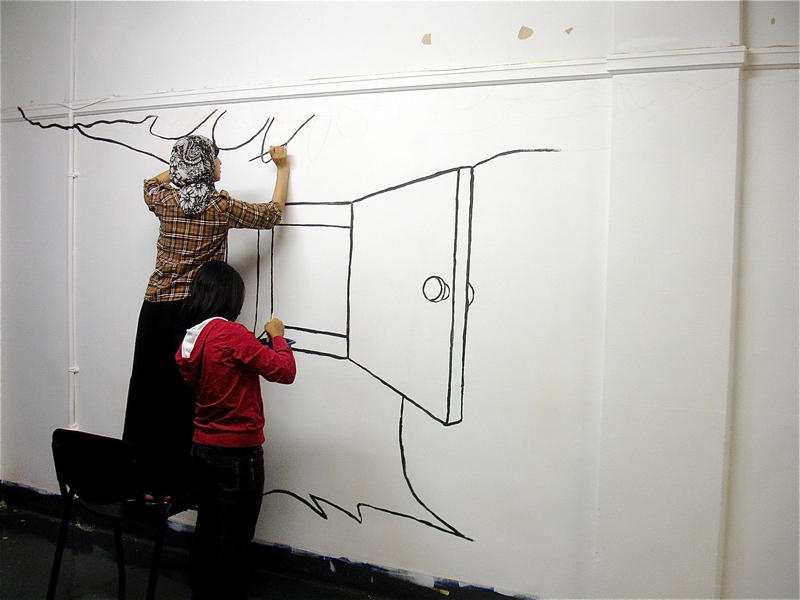 As of 6/11/12 we have completed the process of transferring our drawings to the wall, as well as outlining the images in black paint. The students worked diligently on this process. The line quality is consistent and clear. The outlines are semi-permanent, as they will help to guide us as we apply the color this coming week. This way, we can slightly go over the outlines and not have to worry about mistakes. Once the color has filled all of the specific areas, we will then re-layer over the existing outlines to solidify their contours, making them POP! We have spent some time looking at Keith Haring’s work to help reference a style and technique. 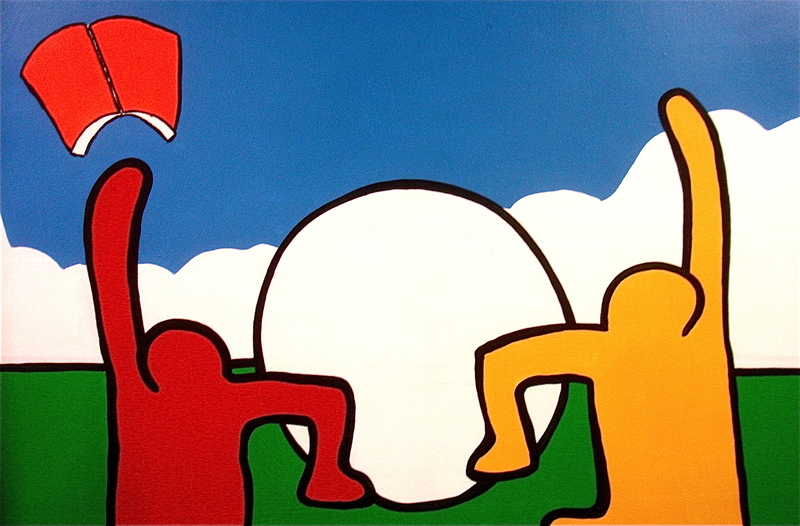 It fits really well, and the students resonated with Haring right away. 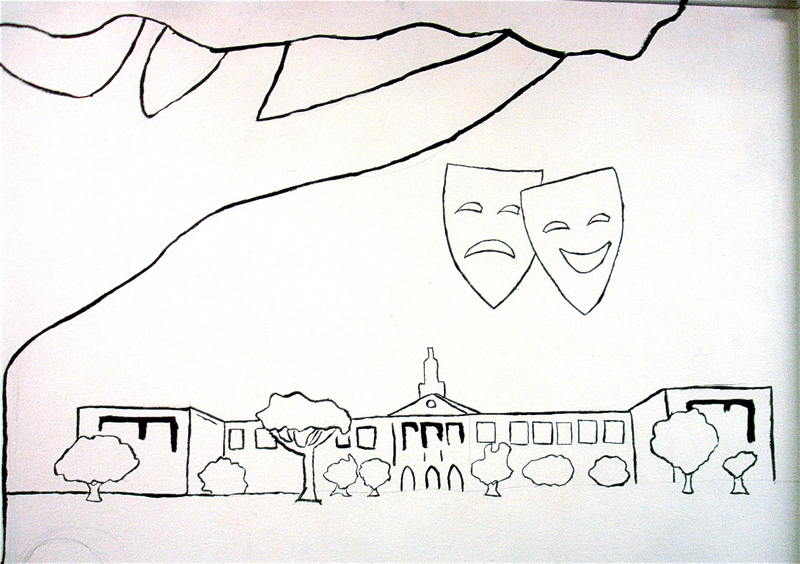 A student works on the outline of the High School’s architecture. With 98% of the outlined composition in place, we began talking about color. We talked about how we were going to distribute it, and what colors will work best for each object and area. The primary colors of Blue, Red and Yellow are frequently used and observed in Keith Haring’s work, a similar color palette will activate the wall and surrounding space for sure. It was agreed upon instantly. 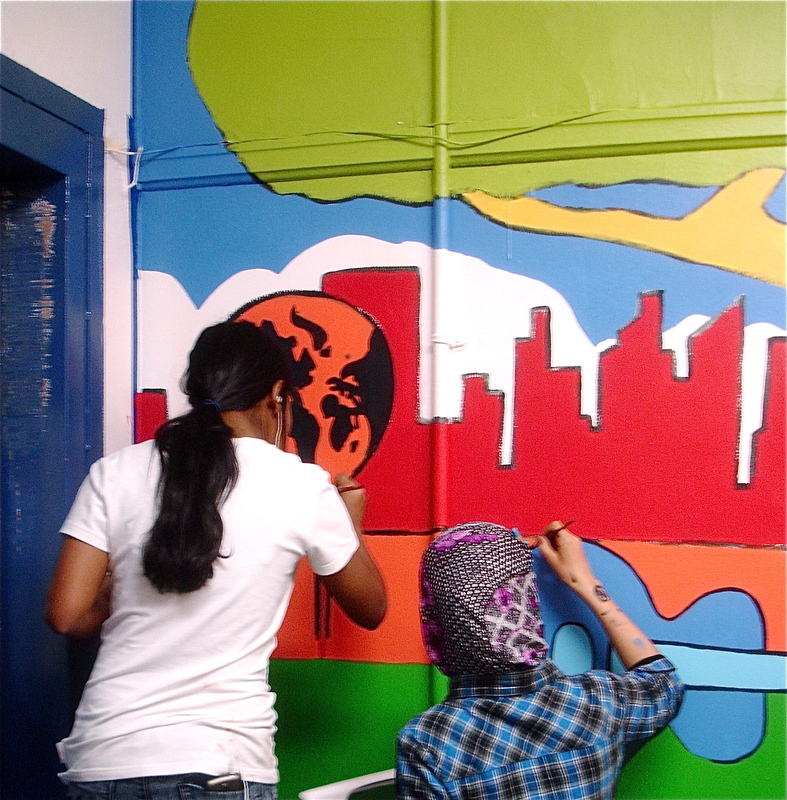 In week #4, here we are applying the first few layers of paint to the wall. We are working from the ground up, layer by layer. 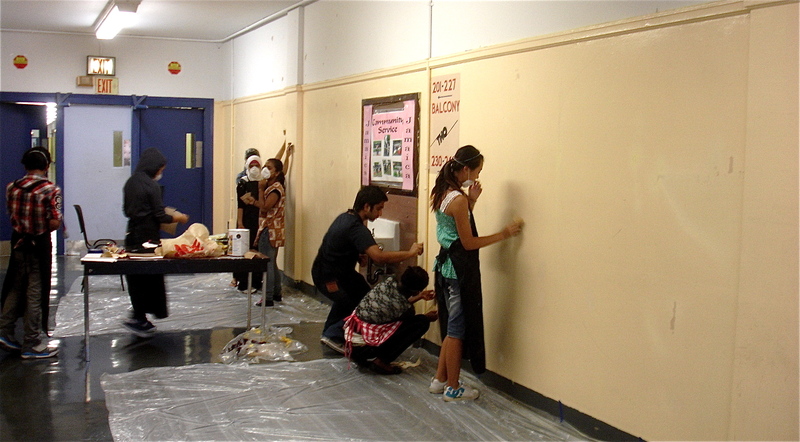 The students discovered that the paint tended to absorb faster as they re-applied it to existing drying paint. The paint also dried faster as we worked higher. On Monday June 18th, we had support and participation from students, faculty, staff members, and the assistant principal. The high school founder and Principal Matt Ritter also joined us! We continue on this Thursday June 19th! We had a large crew that gushed high energy today on the 21st of June! (the longest day of the year.) We were all very grateful for air conditioning as the New York temps reached 98 degrees. 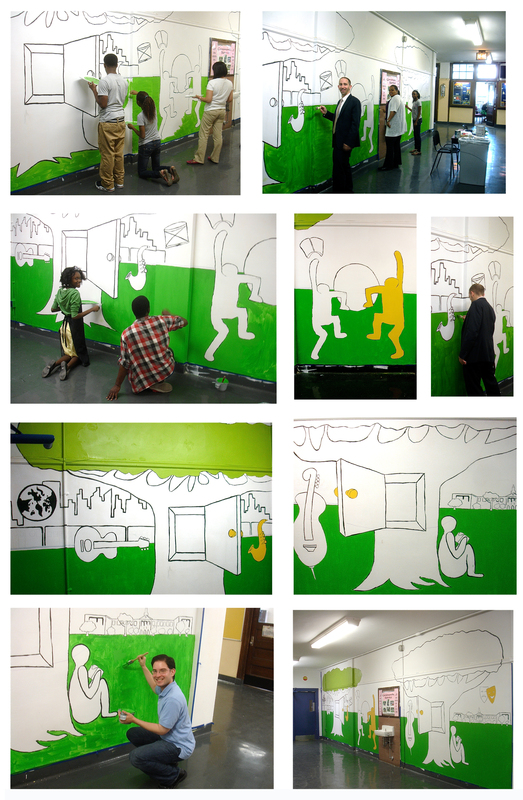 The students spent the day re-applying paint in layers and also filling the largest sections of negative space. 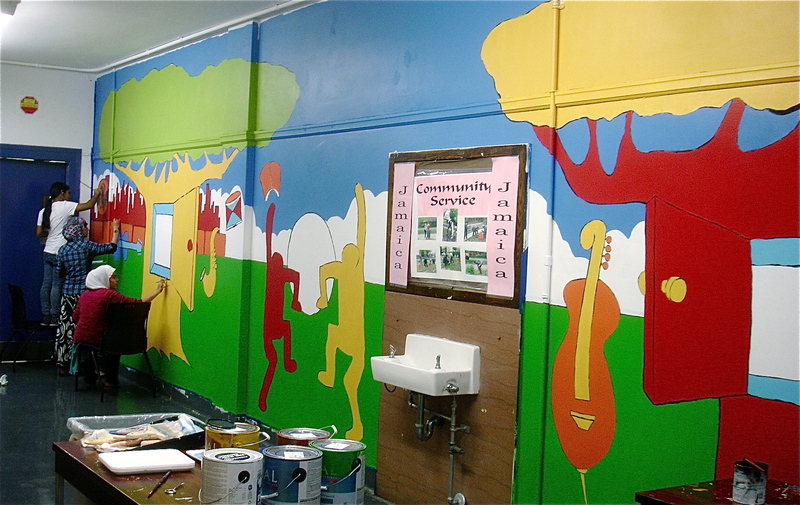 The most labor intensive parts of the mural have been completed. The colors POP and immediately pulls each and every viewer in. 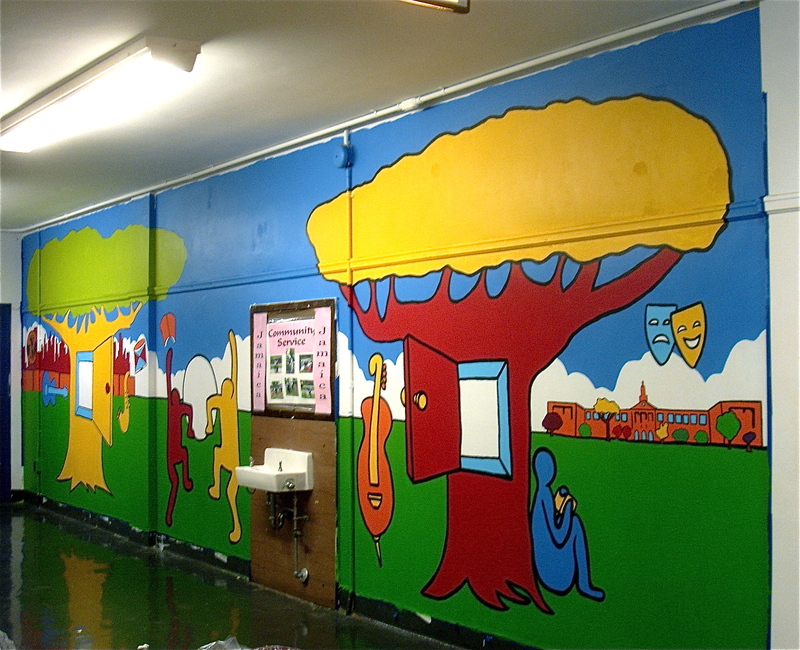 The mural wall is located in a very busy corridor that joins several hallways to the 2nd floor classrooms . It is also directly across from an elevator station. Warm smiles stretched across the faces of our friends, colleagues, and fellow visitors. This coming week we will relayer over the original black outlines that distinguish each object and form from each other. There are still some things to talk about and adjust, but this will be the week to do it. 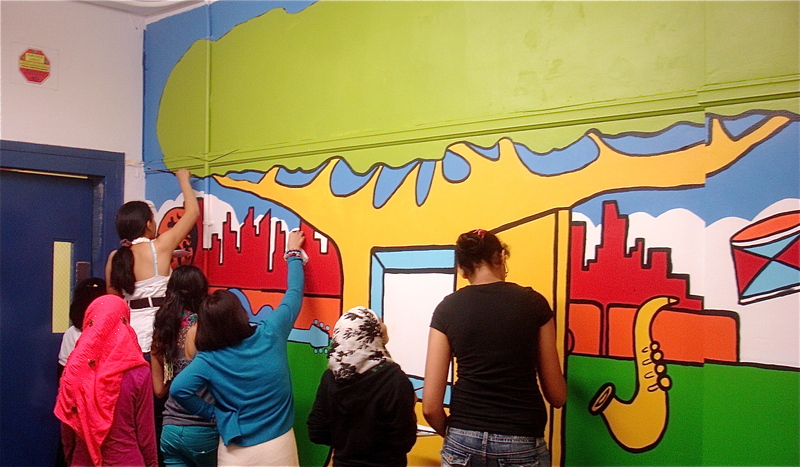 Here we are putting the final touches on the mural. Both of this week’s sessions will focus on re-applying black paint to the same bold outlines that we used for our preliminary map. This process is time consuming and tedious, but it will make the piece POP! The students have worked very hard and diligently through this entire process. They have remained committed and serious to the project. We are lucky to have had such a great array of part time helpers come through the process as well. 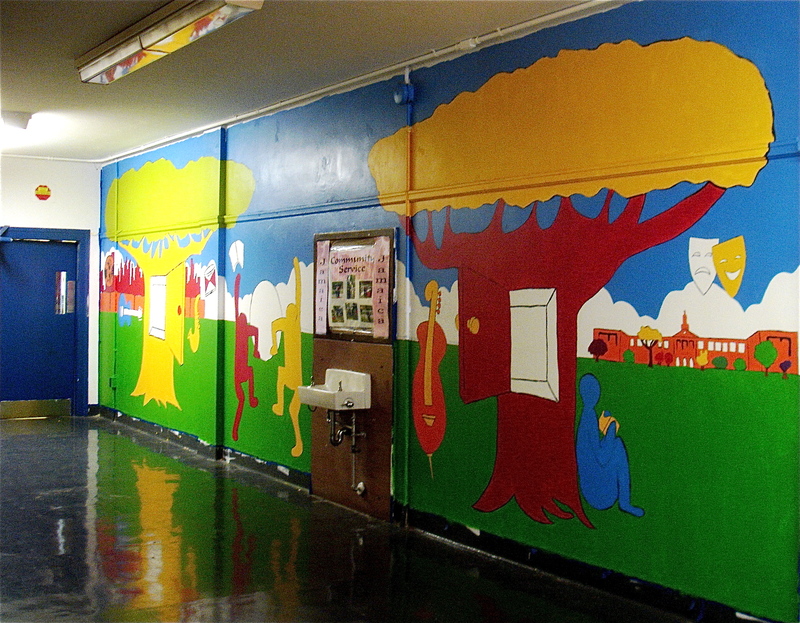 School officially ends this Wednesday 6/27 so it is very important that we finish the Mural! However, not to worry, there are still a few things we will need to add in the fall. Did you notice that the two standing figures are holding a round object? Wonder why? Or did you notice the large area of negative space between the two trees? How come? We do have plans laid out for these areas, but they will have to wait until September. 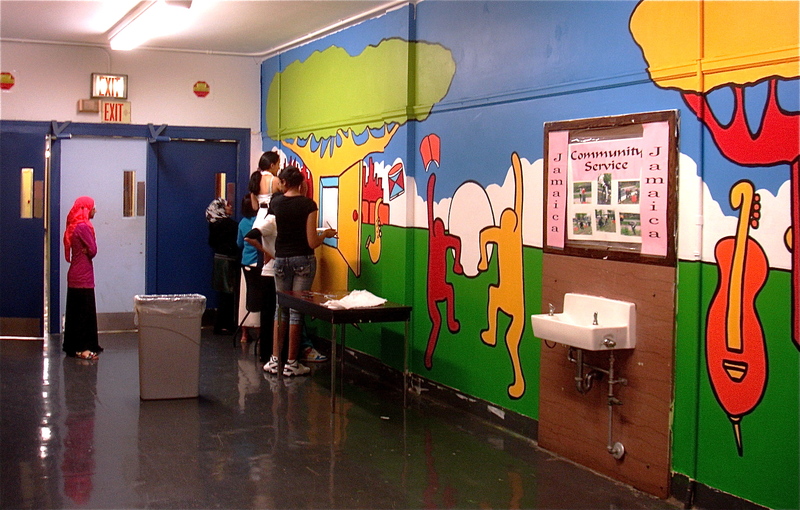 The students felt that re-applying the black outline was one of the most difficult aspects of the project. It is certainly time consuming, we all agreed on that. It created a contrast of our working time for sure. We talked about how the wall was very porous due to the fact that it had been painted over several times year after year, acting almost like a sponge. We also spoke about how the temperature in the working space affected the way the paint dried as it was applied. Lots of new awareness’s were discovered today for sure. 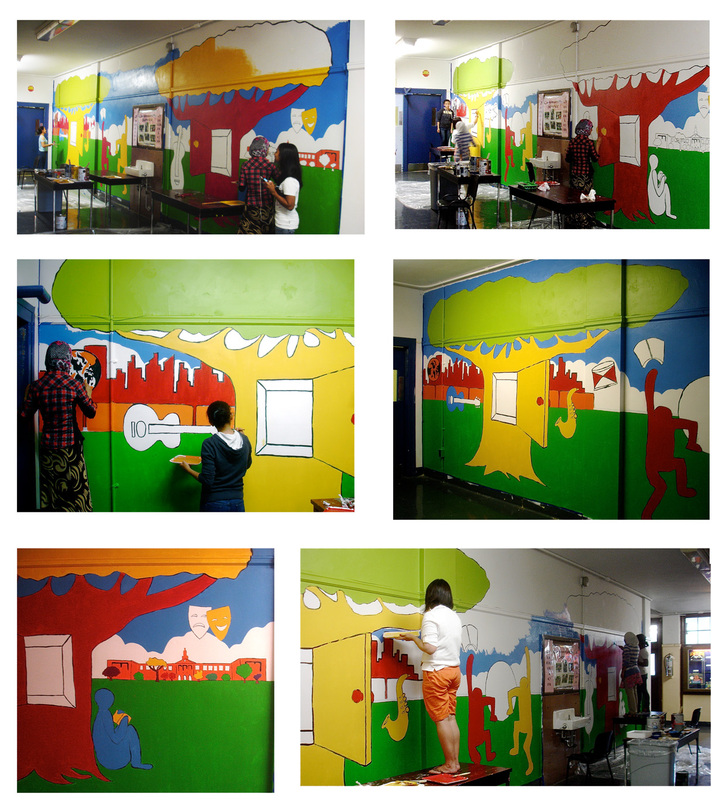 This past Wednesday 6/27/12 was our last and final day to work on the Mural! Although we do still have two tasks to complete in the fall, (we did save those tasks consciously and on purpose) our project has come to an end! I could not be happier with the outcome of this wonderful mural! The students have shown patience, commitment, dedication, perseverance, and an amazing level of artistic achievement. 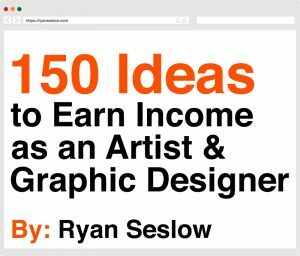 This was an extremely ambitious project in development, process, scale, and time. 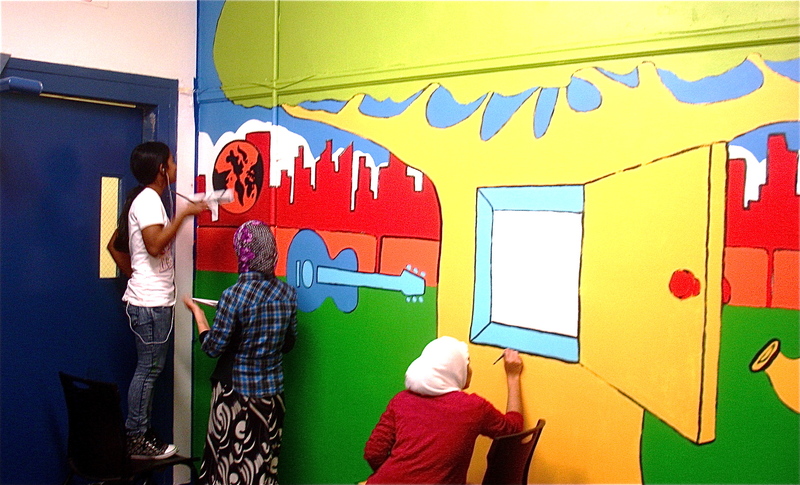 We have transformed a dormant space by filling it with the vibrant color and energy that speaks the mission of the Hillside Arts & Letters Academy, aka HALA. We have activated a new awareness of the space itself, and how the power of the art can reach every person who crosses its path. I would to thank all of the amazing students, faculty, staff, and administrators who have been so great through this process. It is with an abundance of gratitude I thank you. Please feel free to share this post with friends, family, and colleagues. If you would like additional information about the project please feel free to contact me through this blog on the “contact me” page.